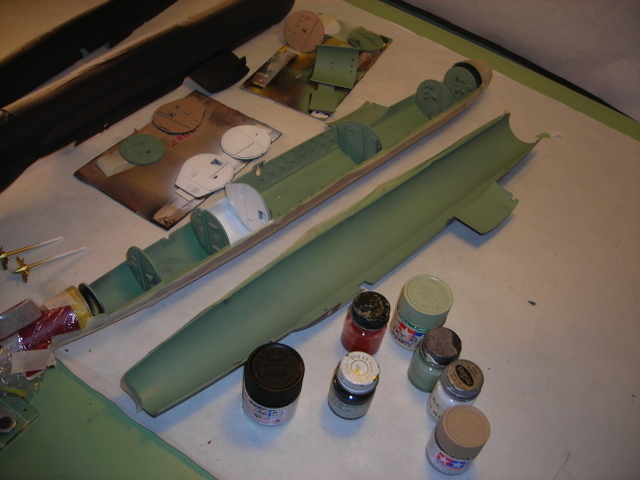 Building an Ethan Allen sub with interior. nino got me interested in this model with pictures of a finished kit. I needed a break on the Victory & built this . It has been fun & interesting. I got interior colors from Bill, warshipguy, & I hope I did it close to right. Ther have been some really nice models of this already & I got a lot of ideas from them. They helped a lot. Here are some pictures. I also have a George Washinton that I am going to do closed because it does not have all the parts. This last picture is the 1/200 Ethan Allen with a Nicnimo IXC 1/200 unfinished to show the size difference. I had to add this because I spent 5 days doing the IXC Nichimo. It really is a beautiful little model. 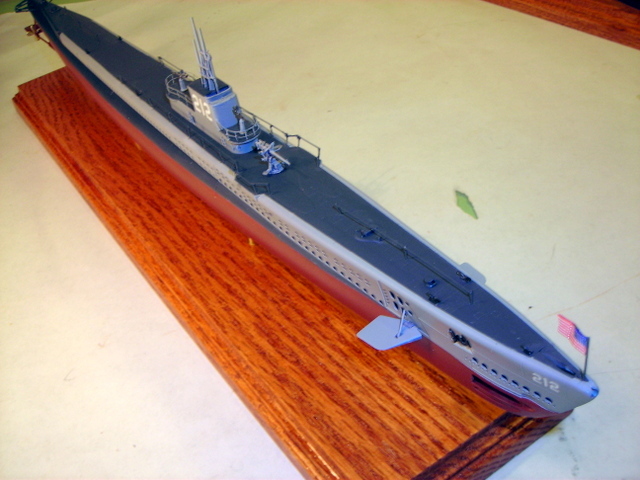 Niether one is mounted on a base yet & I am going to do a Riich 1/200 1944 USS Gato to complete the 3 set. Nice job, is it the old Renwal kit? Yes Stev e, nino gave Bill & I each one. 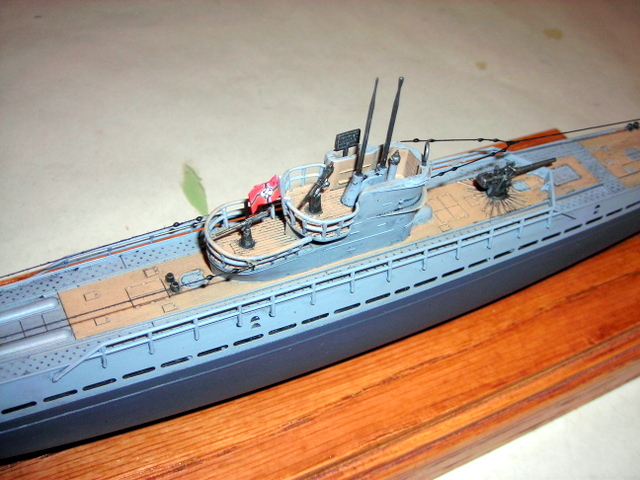 Bill's will be better & more accurate because he spent 3 years on her, & is a better modeler. very nice gene , interesting kit with all the cut away's . Gene, The colors turned out Terrific... and as Accurate as can be without having color Pics of each area of the Ethan Allen. The Pea-Green sure looks authentic from the few photo's I have seen. Many "Builds"/Postings of this kit have been done over the years but I like yours best with the partial cut-away of the control room deck to show more of the crews mess and Bunking ("missile control center"?). And thank you for the pre-painted kit. Still working on moving my Hobby area so it will take some time for me to finish painting and assembling it. So, did you install the spring to fire the Polaris missile? P.S. 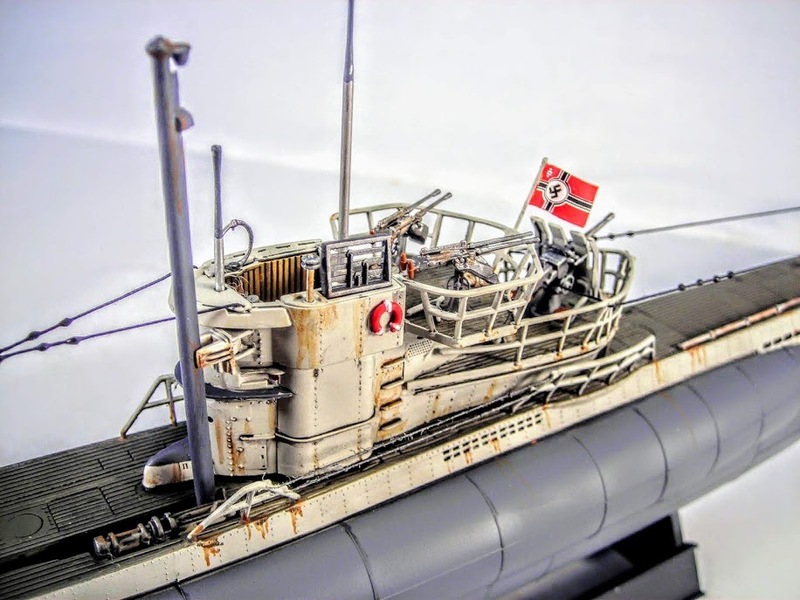 When you get that Bronco 1/200 Russian Kilo sub built, You must post a picture of it next to SSBN-608. Jim, I will show all 4 together, the Ethan Allen, the Russian Kilo, the U Boat IXC & the USS Gato. That will be 2 cold war enemies & to WW2 enemies. Seems in my long lifetime nobody ever liked anybody else. All are in 1/200 . What abig difference in size even then. I got the idea of that cut back deck from, I believe, Phillip !. His is a beautiful build & on FSM. Thank you for the Russian Sub, Bronco does a beautiful kit. Gene , would you have any photos of how you did the cut aways mate . Your builds are so clean and precise. Very well done. Thanks to all of you for the compliments. Steve, this picture I believe shows how I did the cut. I started & went in & out where the desk is & in again & cut a little off the partition outside the door & then in again & out before the next partition. Look at Phillip 1's build, he did it a little differently. His is a beautiful build of this sub. I cut it rough with my Foredom drill & then used a sanding wheel to smooth it. Just be careful. Steve, here is another that might show it better. 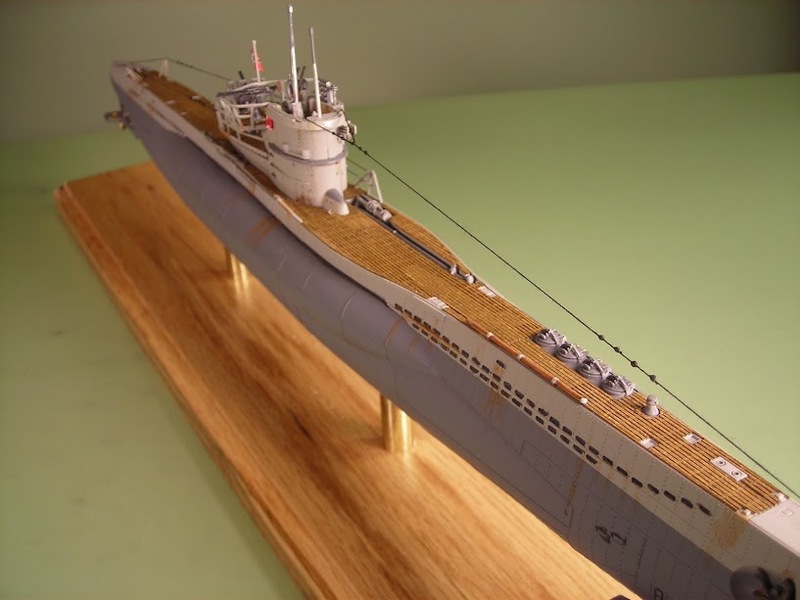 VIIC 41 with a wooden deck. A post of Dr. Tilley's in 2009. "When Henry Blankfort [Revell's vice president for public relations] read the story he immediately recognized this as a marvelous opportunity for some free publicity. He contacted the press and told them Lew Glaser, President of Revell, would be available to answer questions at his home the following day. Then he phoned Lew. 'I'm going to tell you what to do,' he said, 'and then I'm going to disappear.' Blankfort did not want the old allegations of his supposed Communist past to muddy-up the story. When the media men arrived at the Glaser household, Lew dived into the backyard pool with a model of the Polaris sub and surfaced blowing bubbles....A photo of the episode appeared in the next day's Los Angeles Times and later as the picture of the week in Life. [It's reproduced in the book - and it's pretty funny.] The Glasers were invited to appear on radio and TV for interviews. "Nationally syndicated columnist Walter Winchell picked up the trail of the controversy and someone fed him material for one of his columns in which he called Lew Glaser a Trotskyite and denounced Blankfort for taking the Fifth Amendment during the Congressional Un-American Activities hearings of the early 'fifties. "The boys in the model shop at Revell found all this very amusing. 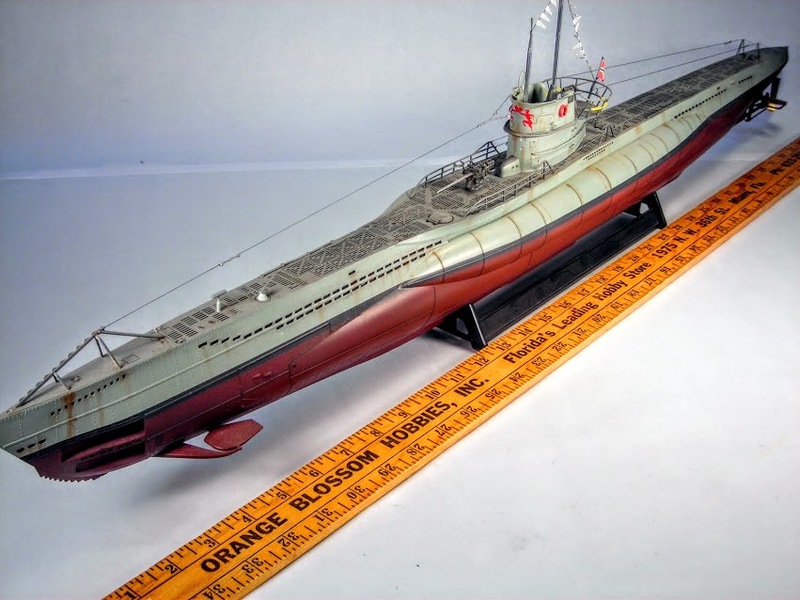 They had, of course, researched the model just as Glaser said, piecing together data on the submarine from whatever sources they could find. 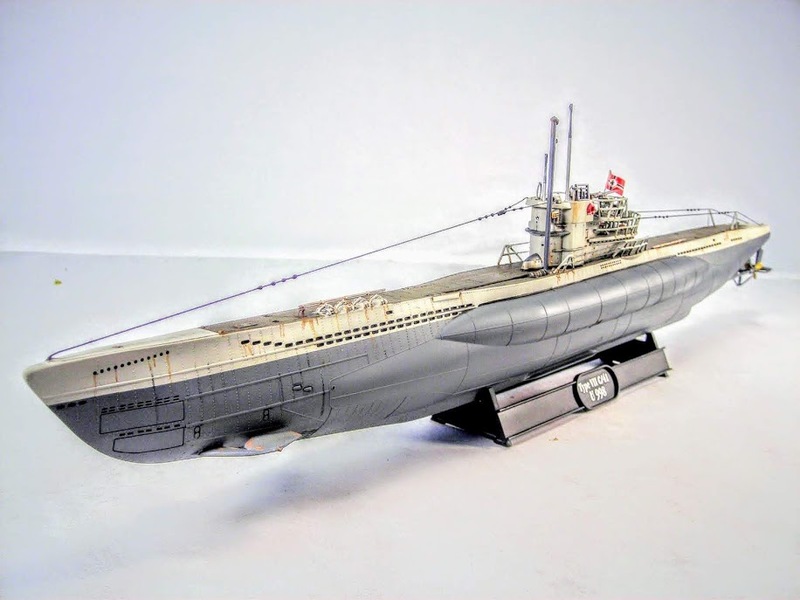 One of the model's creators, Englishman Ron Campbell, recalled that the craftsmen in the model shop had no idea what kind of motor the sub had, so he just gave it a three-stage turbine like those he had once manufactured in his previous job back in Britain. "In the end Royle Glaser [the president's wife] pronounced it "the best piece of PR we ever had, thanks to Admiral Rickover and Henry Blankfort. 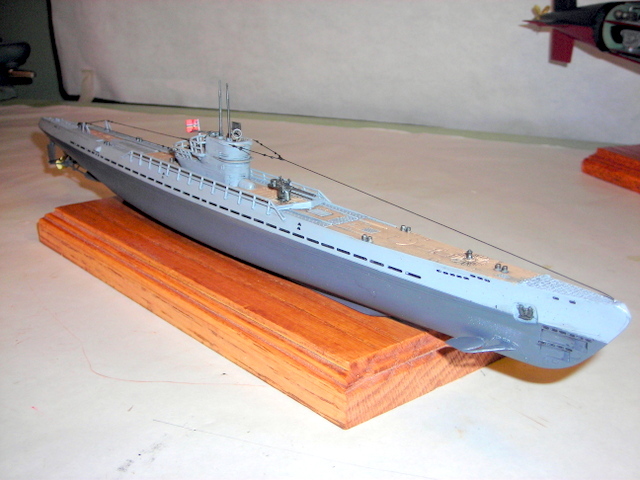 We sold a jillion of the sub models because they were already in the stores."". That build is a treasure. A true classic. 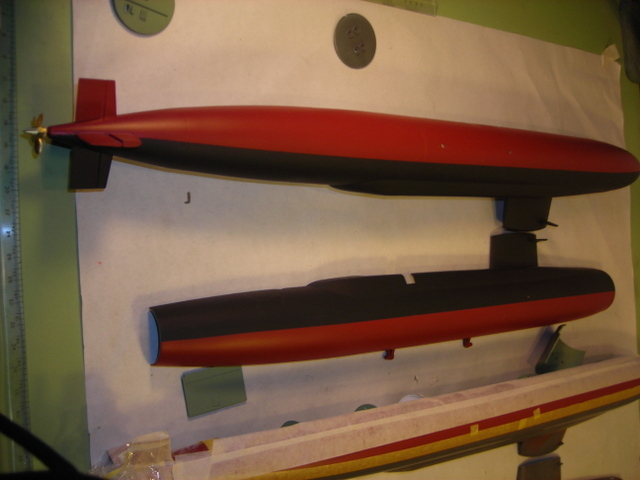 A consideration the modeler should make with a cut away sub that's intended to be accurate is the difference in size between the outer hull and the pressure hull. These modern subs are a set of concentric cylinders, the pressure hull a number of feet smaller all the way around than the outer hull. You did a swell job with this, Gene. Bill, Thanks for the compliment. I took a break from the Victory with the Renwal sub & did enjoy it. Then the little Nichimo IXC sub came in the mail & lured me again to build it. 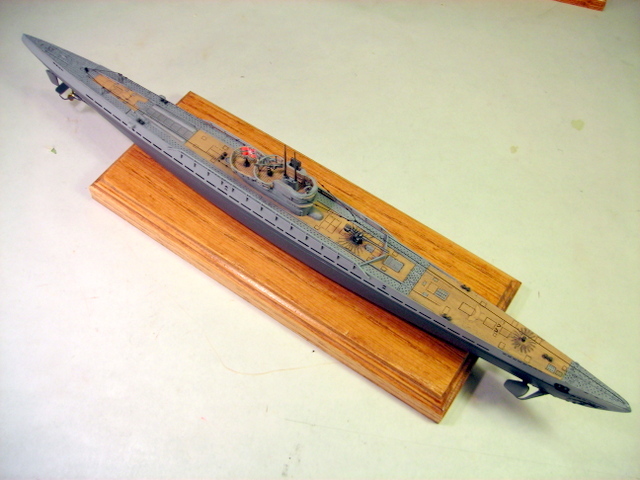 I have a Riich 1/200 Gato coming from Austrailia & that could lure me again before I get back on the Victory. Then nino,Jim, sent me a Bronco Kilo in 1/200 to go with the other 3 1/200. 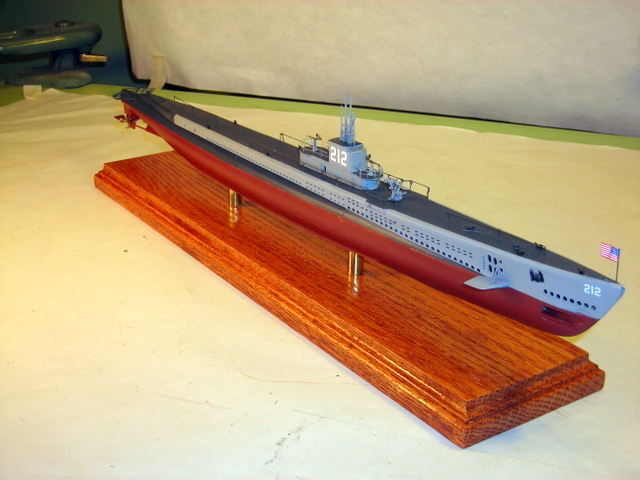 I do love subs because they are easy & fun to build, but I wouldn't have the nerve to get on one. Leave that to warshipguy. I never minded airplanes because you could jump out of them, try that at 300' down. 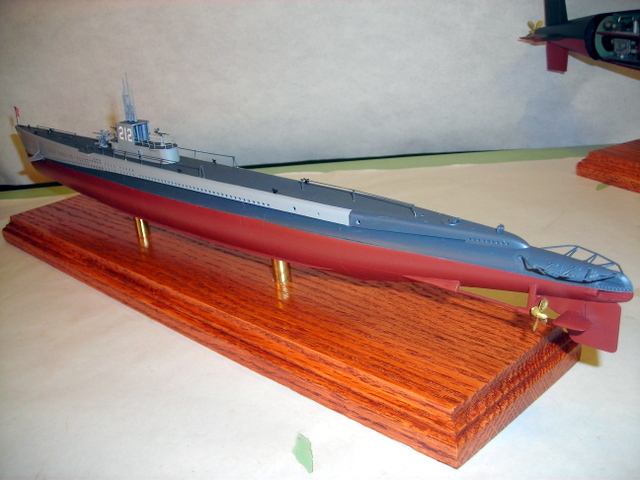 After I finished my Ethan Allen, I went ahead & built the little 1/200 Nichimo IXC U Boat. It is a beautiful little kit & has some very nice casting on it. 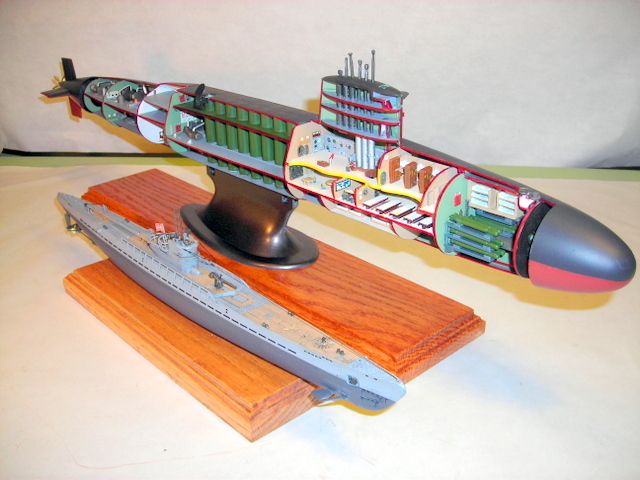 Then I had just gotten a 1/200 Riich USS Gato & now I am just about finished with it. Nino gave me a 1/200 Russian attack sub & I will put the 4 together 2 from WW2 & a big size difference there too, but the difference in 15 years to the Ethan Allen Nuke is huge. Here is the new Gato nearly finished . 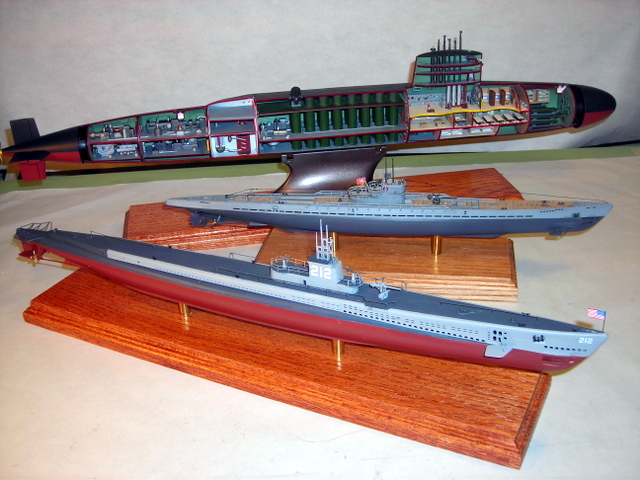 Here you can see the difference in 1/200 sub size from 1945 to 1960. I will do a few more of my Nichimo IXC & this Gato on another post. Here are a few more of the Nichimo IXC. These are really fun to build, but it is time to go back to the Victory. 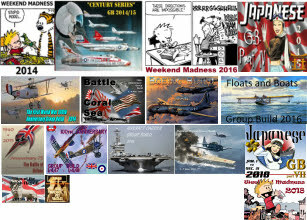 I will do some 1/144 subs after the Victory as the Revell 1/144 kits are my favorites.